Klyuchevskoy (Kamchatka): Explosive activity continues. Volcanic Ash Advisory Center (VAAC) Tokyo warned about a volcanic ash plume that rose up to estimated 17000 ft (5200 m) altitude or flight level 170 and is moving at 20 kts in E direction. Shiveluch (Kamchatka): Explosive activity continues. Volcanic Ash Advisory Center (VAAC) Tokyo warned about a volcanic ash plume that rose up to estimated 14000 ft (4300 m) altitude or flight level 140 and is moving at 15 kts in E direction. Ibu (Halmahera, Indonesia): (14 Apr) Explosive activity continues. Volcanic Ash Advisory Center (VAAC) Darwin warned about a volcanic ash plume that rose up to estimated 8000 ft (2400 m) altitude or flight level 080 and is moving at 5 kts in NE direction. 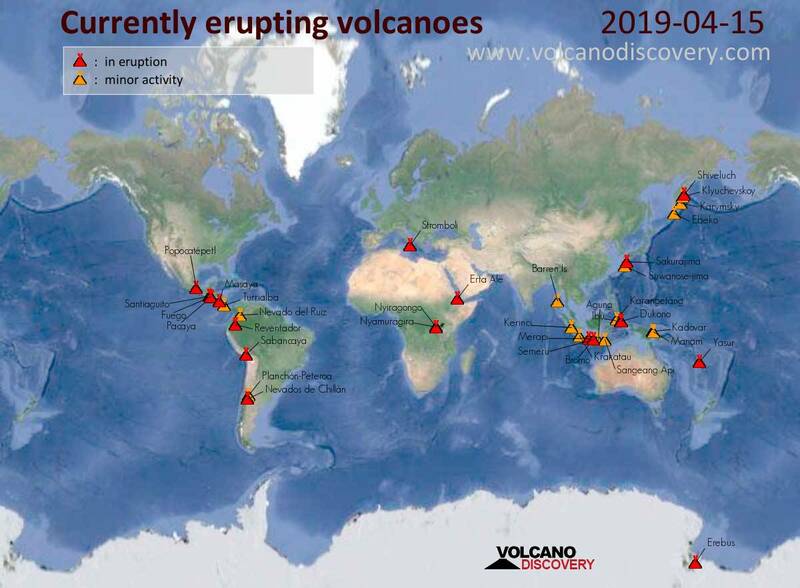 Dukono (Halmahera): Volcanic Ash Advisory Center Darwin (VAAC) issued the following report: CONTINUOUS VA ERUPTION TO FL080. Sabancaya (Peru): Explosive activity continues. Volcanic Ash Advisory Center (VAAC) Buenos Aires warned about a volcanic ash plume that rose up to estimated 25000 ft (7600 m) altitude or flight level 250 and is moving at 10 kts in SE direction.